The website "Truth in Food" has a commentary about farming, titled, "10 reasons why they hate you so." 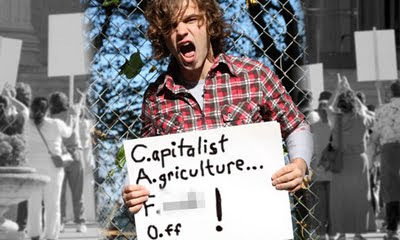 It caricatures the sustainable agriculture movement as being full of hate for farmers and includes the photograph below. Here is my comment submitted to the site. You can win an argument against haters any time. But, so much more of the criticism of modern industrial agriculture is thoughtful and worth reading. It is fair to ask how we can feed ourselves in a way that doesn't sacrifice the future for our children and grandchildren. You won't find hate in the writing of Michael Pollan or the movie Food, Inc. It makes me wonder if you are largely fighting just a straw dummy. And that brings me to ask, where did you get the top photograph of the protester? The alt text says "top news photography." Is that posed or photoshopped? Who took the photograph and when? You can win an argument against the boy with the sign in the picture. But I wonder if he is even real. In any case, he isn't representative of a movement. Update: edited slightly 9/30, 1:45 p.m.
USDA Deputy Secretary of Agriculture, Kathleen Merrigan will hold a Live Facebook Chat about local food systems on Thursday, October 1 at 3:45 pm ET. Comments and questions can be submitted via the USDA Facebook page. USDA-wide effort to create new economic opportunities by better connecting consumers with local producers. It is also the start of a national conversation about the importance of understanding where your food comes from and how it gets to your plate. Today, there is too much distance between the average American and their farmer and we are marshalling resources from across USDA to help create the link between local production and local consumption. As a former student of Kathleen, I am reminded of something she told us in her policy class: "think big!" She is dedicated to the "People's Department" being just that, and this is her way of including all in the conversation. 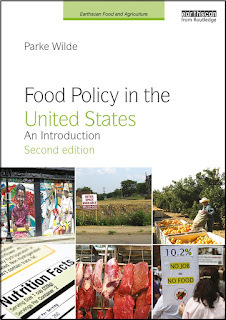 I was asked by blogs.com from Six Apart to compile a list of 10 food policy blogs. In this list, [Parke] looked beyond the excellent sites that already appeared in a recent list at Culinate, which included Ethicurean, Green Fork, ChewsWise, Food Politics, Politics of the Plate, Grist, Civil Eats, and Obama Foodorama. Parke’s list adds some more blogs from within what might loosely be called the “good food movement,” but it emphasizes other selections that he reads to maintain diversity in his information stream. For legal news and insight, a member of the Law Professor Blog Network. More legal blogging comes from the Agricultural Law blog. The dry but substantial electronic magazine from USDA’s Economic Research Service, with accompanying RSS feed, is enough like a blog to make this list. In the same vein, one could mention Choices electronic magazine from the Agricultural and Applied Economics Association (AAEA). A thick stream of news and policy commentary from a local food perspective. By the staff of Capital News agriculture newspaper. A thorough summary of daily agricultural news coverage, with excerpts and little editorial commentary. Practical food shopping advice. No pills. No industry affiliation. Focusing on industrialized food production systems. Commentary on food poisoning outbreaks and litigation. News about food assistance programs and the anti-hunger movement. The food business blog at Slate’s site, The Big Money. The U.S. Department of Agriculture's Agricultural Marketing Service (AMS) last week held the first in a series of formal hearings about the agency's proposed marketing agreement to improve the food safety of leafy greens. The proposal stems from a deadly 2006 E. coli outbreak in spinach, which cast doubt on the adequacy of existing food safety oversight. An article by USDA's Economic Research in 2007 summarized the policy responses that were considered. The hearings, in Monterey, California, September 22-25, collected public input on the federal government's proposal to create a national Leafy Greens Marketing Agreement (LGMA), similar in some respects to a marketing agreement that was adopted in California after the outbreak. Handlers who adopt certain food safety requirements stipulated in the agreement would earn the right to put a seal on the label, a sort of endorsement from USDA much like the "USDA prime" label for a particular grade of beef. Federal food safety oversight is divided between multiple agencies, most importantly the Food and Drug Administration (in the Department of Health and Human Services), whose jurisdiction includes produce safety, and the Food Safety Inspection Service (in USDA), which oversees mandatory inspections for beef and poultry slaughter. Nevertheless, the marketing agreement would be voluntary for produce handlers and would be overseen by AMS, a USDA marketing agency, instead of either FDA or a food safety agency within USDA. In the first of a series at Ethicurean, Elanor Starmer notes that marketing agreements usually enforce standards for the size or appearance of a product, not its food safety. She points out that the agreement would be voluntary for produce handlers, but would seem mandatory from the point of view of a farmer who must sell to a handler that participates in the agreement. The Cornucopia Institute goes further in arguing that organic practices that preserve wildlife could be forbidden under the terms of the agreement, so small-scale organic producers could be prevented from using the proposed USDA seal: "[T]he proposed safety standards, which have been described as a 'corporate-backed marketing ploy,' may give agribusinesses using the new food safety seal a boost and lead many consumers to assume that vegetables from industrial-scale monoculture farms, primarily in California, are safer than the leafy greens available from local growers around the country." [On a somewhat related topic, here is Carol Tucker-Foreman's recent Huffington Post commentary, saying that small and organic farms have little to fear from a food safety proposal under consideration in Congress]. An early Federal Register notice (.pdf) from AMS emphasizes the contrast between a voluntary marketing agreement and a potentially mandatory marketing order. Many produce handlers prefer the voluntary marketing agreement approach to federal regulation through a food safety agency. The Smart Choices labeling program has created quite a stir. Following a critical New York Times article earlier this month, which Ashley Colpaart discussed here, the story has been picked up by other major outlets. Rebecca Ruiz scrutinized the program's funding sources in Forbes magazine [update: sentence corrected 9/25/2009]. Mark Bittman shared his wit in a tour of a supermarket aisle on ABC's Nightline. Tom Laskawy at Grist called the program a dumb move. My dean at the Friedman School at Tufts, Eileen Kennedy, who is a board member for the Smart Choices program, was quoted in the Times defending the inclusion of Froot Loops, which has become the poster child for questionable products included in the program. She has taken a lot of grief for this, including unfair emails and telephone calls. She argues, in person and in public, that the participating companies deserve credit for the social responsibility they showed in giving up their separate food labeling schemes and agreeing to the stricter "Smart Choices" standards. If Froot Loops meets well-defined standards, then wouldn't it be wrong to exclude the brand simply because one doesn't like its marketing associations? The Froot Loops example highlights a weakness of the Smart Choices program, which seems to favor reformulated branded manufactured products over traditional simple healthy foods, such as fresh fruits and vegetables. Dean Kennedy responds that all fruits and vegetables without additives qualify for the program, a point that was omitted from the New York Times article. The Smart Choices program would have been wise to anticipate the criticism that it favors highly processed foods. The program could have considered stricter criteria in some areas, such as sweetened cereals. More importantly, it could have achieved a different emphasis even with the program's current criteria. It could have more strongly highlighted fruits, vegetables, and whole grains, while giving a lower profile to products that have been slightly reformulated and artificially enriched to just barely meet the nutrient criteria. Then, reformulated Froot Loops might still have qualified, but the program would have been on stronger ground choosing a different poster child product -- any of thousands of simple, healthy, delicious, traditional foods. Instead, the program's one-page fact sheet (.pdf) promotes plenty of manufactured packaged food brands but no traditional healthy foods. The program's board includes major manufacturers, but no producers or retailers of less processed fruits, vegetables, and whole grains. The program should have anticipated criticism of its fee structure also. Although it has a sliding cost scale for food companies, with larger fees for products that have bigger sales, the low end of the scale is still too expensive for commodity producers (comparatively small-scale producers of a non-branded food product). If the program is not just a marketing ploy for food manufacturers, or a revenue stream for the non-profit program itself, then it should permit the seller of an apple without additives simply and freely to use the Smart Choices logo. If an apple automatically meets the program's criteria, it is difficult to see what type of review the program would undertake that would justify even a modest application cost. Currently, if you search for "apple" on the program's website, you find all about Apple Jacks and very little about apples. Marion Nestle's blog has covered this issue with cutting insight. Advocacy groups have been having a field day. Change.org is running an email campaign, with thousands of signatories already. Somebody has apparently circulated an email list of people to contact that includes faculty like myself. I read every email with interest, even though there is not much mileage in lobbying me on this topic. In the past five years, competing FOP [front-of-pack] symbols on food labels have proliferated. Consumer research suggests that these competing symbols, which are based on different nutrient criteria, are likely to confuse consumers. In this context, we recognize the potential value of a more standardized approach for FOP labeling. However, since products bearing the Smart Choices symbol are just beginning to appear in the market, we will need to monitor and evaluate the products as they appear and their effect on consumers' food choices and perceptions. FDA and FSIS would be concerned if any FOP labeling systems used criteria that were not stringent enough to protect consumers against misleading claims; were inconsistent with the Dietary Guidelines for Americans; or had the effect of encouraging consumers to choose highly processed foods and refined grains instead of fruits, vegetables, and whole grains. Of course, some of FDA's concerns would seem to apply equally well to other front-of-pack labeling programs, not just Smart Choices. The Board of Directors page on the Smart Choices website formerly listed affiliations for directors with senior roles at the American Diabetes Association, Baylor University, and Tufts University, but these affiliations have been removed. In an August 5 press release, the American Society of Nutrition (ASN) seemed proud to "jointly administer" the Smart Choices program along with a non-profit organization called NSF International: "Together, ASN and NSF International are committed to ensuring that the Smart Choices Program is credibly implemented, governed, and monitored." Now, however, some of the references to the ASN role have been deleted from the Smart Choices site -- for example, they have been removed from the one-page fact sheet (.pdf). ASN has tried to clarify its role in the program in a letter to members: "ASN does not own the program and does not endorse the products under Smart Choices." I wonder if leading institutions in the nutrition profession are reconsidering the program. The federal government's most important anti-hunger program provided food assistance to record numbers of low-income Americans in June. For the first time ever, the Supplemental Nutrition Assistance Program (SNAP), formerly known as the Food Stamp Program, served more than 35 million people in June, according to the most recent monthly data from USDA's Food and Nutrition Service. The program supports a monthly budget for food from grocery stores (not counting restaurants) of $668 in a family of four (or $167 per person). Very poor households receive this full food budget from the SNAP program, while low-income households that are a little better off are expected to contribute a portion of their own cash income to their food budget. (An interesting "food stamp challenge" or "SNAP challenge" is to try to live for a week on a food budget of $38, as a way of learning about food conditions for low-income Americans). Following a substantial benefit increase in April (.pdf), which was part of the federal stimulus package, the average per person monthly benefit was $133 in June, compared with $101 a year earlier. This raised the federal cost for benefits to $4.7 billion in June, compared with $2.9 billion a year earlier. The cost of the SNAP program responds automatically to economic conditions (.pdf), expanding during recessions and contracting during good times. A major research challenge over the years has been to understand exactly how strongly the SNAP caseload responds to economic conditions and policy changes. Here is a Google gadget showing the time series for the SNAP / Food Stamp caseload over the years. Here is a second gadget showing, for each state, how the SNAP caseload responds to the unemployment rate and other economic and policy variables. The size of the bubble is proportional to the state population. When the unemployment rate rises, the bubble moves rightward. When the proportion of the population receiving SNAP benefits rises, the bubble moves upwards. The color changes show the date of implementation for important welfare reforms during the 1990s. One cool thing to do with the second gadget is to click on a particular state, to see how its experience is similar to or different from other states. For example, if you select Louisiana (near the top on the left in the opening setting), you can see the dramatic effect of Hurricane Katrina on food stamp / SNAP participation. Another cool thing to do is to notice the effect of economic conditions on food stamp /SNAP participation. The whole cloud of bubbles drifts upward and rightward during recessions, and downward and leftward during economic expansions. But there are interesting exceptions. During parts of the current decade, there was economic expansion but food stamp / SNAP participation kept rising. Graduate students Joseph Llobrera and Hanqi Luo helped with the gadgets. Feel free to comment on interesting things you notice in these data. Though much remains to do, there has been progress in recent years in providing the public with information about food safety recalls. An important development has been a USDA policy to release information about the retailers where recalled products were sold. Previously, this information was hard to get. Currently, the USDA Food Safety Inspection Service (FSIS) seems to provide retailer information about some but not all recalls. There is a new widget for food safety recalls and alerts from the federal government's consolidated food safety page (I don't have the widget working right yet, and may add it to the sidebar in the future). Hat tip to Marion Nestle's Food Politics blog. The U.S. food system relies fundamentally on hired farm workers. The physical labor is as hard as any in the U.S. economy, it is sometimes dangerous, and it pays little. Hired farm workers make up a third of the total agricultural labor force and are critical to U.S. agricultural production, particularly in labor-intensive sectors such as fruits and vegetables. The hired farm worker labor market is unique because it includes a large population of relatively disadvantaged and often unauthorized workers, a portion of whom migrate to, and within, the United States. Hired farm workers are usually recent immigrants, and frequently undocumented. Wages remain low, because the supply of laborers is great, and their alternatives to farm labor are limited. Even as a market economist, who usually admires the way a free labor market assigns workers to the jobs where their work is most valuable, I can barely wrap my mind around the gulf between the farm laborer's wage and the consumer value of the food he grows. Considering these economic fundamentals, hope for higher wages requires either great courage or an active imagination. This July, I visited Immokalee, Florida, to meet a group of farm workers with that kind of imagination, and ... a strategy. Lucas Benitez, with the Coalition of Immokalee Workers, gave a tour including the Coalition's community center, radio station, and cooperative food store. A walk through the neighborhood took in trailer residences for seasonal workers and the site of a compound where workers had been held against their will. The Coalition focuses on winning concessions from branded retail and restaurant companies, like the Publix supermarket chain or the leading fast food brands such as Taco Bell, Burger King, and, most recently, Chipotle. For example, the CIW might ask Taco Bell for a penny per pound more for tomato pickers, who get paid according to the quantity they pick. The strategy is clever, because these branded companies have a strong incentive to reach an agreement. The branded companies rely on consumer goodwill toward their brand, and the cost of the agreement is tiny relative to the final retail value of the foods sold. By contrast, the farms in Florida that actually hire the laborers and grow the tomatoes operate in a cutthroat competitive market. 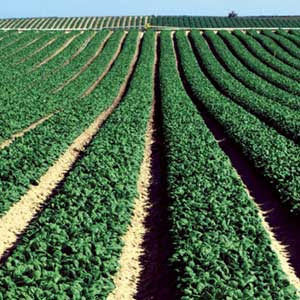 The farms are large, as farms go, but still they are very small compared to a supermarket company or a fast food chain. Even for a prosperous farmer, a small wage increase without a commensurate increase in the tomato price is a frightening proposition. While in Immokalee, I spoke with University of Florida agricultural economist Fritz Roka, who has written about the economics of farm labor in Southwest Florida. He noted the competitive pressures on Florida growers and the possibility that higher costs could shift tomato production to other parts of the country, or overseas. But perhaps it's not just economics that drives the Florida farmers to fear improved wages. One of the strangest twists in the CIW's campaign came after the Coalition won its first victories from several fast food chains, but then had trouble finding farmers who were willing to pass along the wage premium. Even though it didn't cost the grower anything, because the premium is paid by the fast food chain, most growers refused to collect the premium and pass it along to the workers. The Florida Tomato Growers Exchange, an organization of farmers, threatened to fine any member who participated in the premium agreements. In other words, it is not just market economics that keeps the laborer's wage low. The growers actively coordinate their efforts to prevent the premium from being paid. Casting about in vain for an explanation for the growers' stance, I wonder if the farmers are just offended at the gumption of the immigrant laborers in demanding for a higher wage rather than accepting the natural hierarchy of the local economy. Among Florida's many cultural traditions, a flavor of the pre-Civil-Rights Deep South still has a place. I emailed Reggie Brown at the FTGE in July to get the growers' perspective for this post, but received no response. The CIW's opponents in the region want to paint the Coalition as too radical, but it may be that any demand for higher wages gets counted as radical. I asked Benitez about the CIW's reputation. He responded that the CIW has many allies when it asks for better working conditions. For example, there is a broad support in Florida for better portable toilets in the field, or access to water to prevent dehydration, or food pantries and social services. But, I get the sense that the CIW occupies a more lonely piece of ground when it imagines that farm workers could ever have higher wages. Tom Philpott, The human cost of industrial tomatoes. Barry Estabrook, Politics of the plate: Florida's slave trade. And, for its detailed word portraits of Immokalee's workers, Carlene Thissen, Immokalee's fields of hope. Update (9/9/2009, 5:15 pm): A press release late this afternoon gives a timely update on the Chipotle situation, emphasizing the key challenge of finding a grower to pass along a per-pound premium to the workers. Chipotle has reached an agreement with East Coast Farms, a tomato grower, to pass along the premium. In the past, the CIW has pressed Chipotle, in addition to establishing the extra payment, to also commit in writing to keeping it (so the decision cannot be reversed). The press release says the new program follows months of discussion with the CIW, though it did not say explicitly whether CIW has yet endorsed the program as adequate. According to Congressional Quarterly, the Child Nutrition Law will likely be extended past its September 30th sunset, since no Committee has dropped a reauthorization bill yet. However, no timeline for extension is given in the CQ article. National Sustainable Ag Coalition indicated, in their update today, that the reauthorization likely will not be taken up until the spring, specifically due to disagreement between the House and Senate authorizing committees on how to fund improved nutritional standards for school meals. National and local groups have begun to take up a variety of positions on provisions in the reauthorization of school meals, WIC and other national feeding programs, ranging from nutritional standards to reimbursement rates for the National School Lunch Program to Farm to School funding, which we will elaborate on in the coming weeks. The Smart Choices Program™ was created by a diverse group of scientists, nutritionists and food industry leaders, to harmonize existing front-of-pack nutrition labeling icons, symbols and systems. The intent is to provide a single, simple message for the consumer - regardless of which brands they buy or stores they shop in. Our vision is that the Smart Choices Program will be the most widely-used front-of-pack nutrition labeling program in the U.S. across retail channels and brands. The Smart Choices Program provides a front-of-pack symbol and calorie indicator that helps consumers make smarter choices for products in 19 categories, including: cereals, meats, fruits, vegetables, dairy and snacks. The categories also include: snack foods and sweets, desserts, water (plain and carbonated), and fats, oils and spreads. In July, the American Journal of Clinical Nutrition (AJCN) published a meta-analysis on the nutritional quality of organic versus conventional food creating a stir in the media. (See our previous post) This month, the American Dietetic Association (ADA) has published a 'Hot Topic' which takes a more holistic approach to the benefits of organic food. According to ADA, 'Hot Topics' are "short, concise practice and science-based answers to current questions Registered Dietitians (RD) may receive." The 'Hot Topic' was co-authored by Christine McCullum-Gomez, PhD, RD and Anne-Marie Scott PhD, RD of the Hunger and Environmental Nutrition (HEN) Dietetic Practice Group (DPG) of ADA. In their review they challenge the AJCN study for "not examining differences in contaminants (such as pesticide, herbicide or fungicide residues) or the possible environmental consequences of organic versus conventional production practices." Further, the authors claim there are benefits to organic beyond human nutrition. When considering benefits and costs of organic versus conventional agricultural production, it is important to consider benefits and costs to consumers, farmers, communities and the environment. For example, current research in numerous areas is showing both short-and long-term benefits to our population and the planet with organic and other sustainable production systems. Documented environmental benefits of organic production systems include reduced nutrient pollution, improved soil organic matter, lower energy use, reduced pesticide residues in food and water and enhanced biodiversity. It is refreshing to see ADA taking this approach. The challenge for our field (dietetics) is to understand exactly how foods and food products are grown and manufactured and the effects these methods may have on our personal health and the health of the global environment. Disclosure: I am a HEN member. HEN is currently one of the fastest growing DPG of the ADA. (phew..a lot of acronyms) Congratulations to all of the HEN members who worked hard to get this document written, reviewed and published. The New Entry Sustainable Farming Project (NESFP) was featured on NPR's Here and Now last week highlighting two farmers, one from Zimbabwe and the other from Cameroon, that have transitioned to their own farms. The segment is titled Pumpkin Greens Grow in Massachusetts. "assist people with limited resources who have an interest in small-scale commercial agriculture, to begin farming in Massachusetts. The broader goals of New Entry are to support the vitality and sustainability of the region's agriculture, to build long term economic self-reliance and food security among participants and their communities, and to expand access to high-quality, culturally appropriate foods in underserved areas through production of locally-grown foods." You can access their blog here.